“Witch” is totally understandable, even though she acts like a wicked “which” most of the time. I love your way of turning a phrase. Thanks. Shows what happens when the artist drops out of school to do tattoos. OMG! 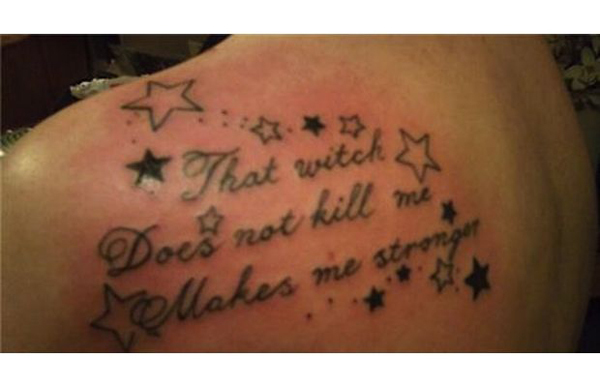 That is one terrible reminder of a painful encounter with someone who needs to learn how to spell And, she paid good money to be “botched”. Note to self….have the tattoo artist write out him/herself what I want to go on my skin for the rest of my life! Don’t feel guilty. At least I didn’t show her name. Put a comma after “me” and then follow it with “she”. Does it make sense, No? But how many tattoos do? Hey that’s great. She should add it under her existing tatoo. I have read that the tattoo fad is predicted, by people who study such things, to pretty much run its course in this decade. Can’t be soon enough for me. And my grandkids. Oh I think it would be pretty bad to be the lame old person with a tatoo. Now there’s a note to carry home. How funny! English must be their second language … or … grade D in English.